With 7 first place finishes Mark Dennis, sailing his Prime Number made sure of winning the 2012 RM Veterans National Championship Hosted by Chelmsford Radio Yacht Club at the Channels Lake on Sunday 8th April 2012. The event was run on an Olympic Course that was allowed to remain unchanged until the last two races when Race Officers George Beacroft and Graham Bartholomew were forced by a wind change to make adjustments. 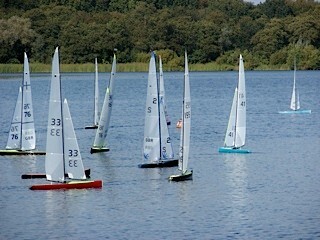 The whole event was run and sailed in good humour and the few incidents that occurred were all dealt with on the water. Sadly John O’Brian had a winch break down in the sixth race that forced his retirement from the event. 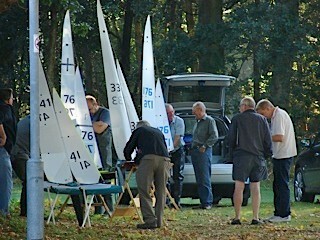 The remainder of the fleet of ten, went on to sail a total of seventeen races on the best weather day of the long weekend. Full details of the results can be found on the ‘Results’ page. Report and photo courtesy of John Richmond. Sunday the 2nd October saw 12 competitors, from Chelmsford, Guildford, Norwich and the Broads clubs together with one overseas visitor gather at the headquarters of the Broads Radio Yacht Club to compete for the Broadland Trophy and to decide who would be the Eastern District RM Champion in 2011. The day began warm and sunny with a very light southerly breeze which made setting a course difficult for the Race Officer but after some head scratching a simple windward/leeward course was decided upon which provided two good, long beats and some interesting mark rounding in the fickle and swirling breeze. Two additional marks were placed in strategic positions in the water should it become necessary to change things later. 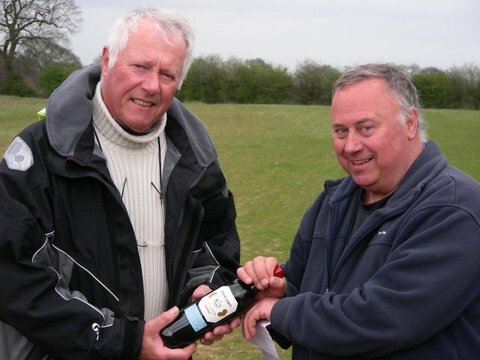 Three different winners of the first three races – Alf Reynolds, Graham Bantock and Terry Burton, promised some interesting racing to come however Graham then signaled his intent by winning the next three races. Race seven was won by Agustin Moreno and Martin Crysell then stepped up his challenge by finishing first in races eight nine and ten. As the day progressed the wind grew stronger and moved towards the west which made it possible to change to a triangle and sausage course, retaining the long beats but adding two reaching legs. Rick Buxton won races eleven and fifteen, Graham Bantock race twelve, Agustin Moreno race thirteen and fourteen. Terry Burton finished the day with another win in the final race of the day. Sixteen races and no protests taken to committee – a most enjoyable day. 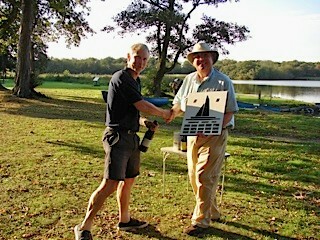 Graham Bantock won the Broadland Trophy and retained his position as District Champion. Thanks to Peter Sutton for the report and photos. Centenary RM Veterans National Championship. Please click on Centenary RM Veterans National Championships for full details of the Centenary Veterans National Championships hosted by Chelmsford RYC on Sunday 15th May 2011. With a cool southerly wind increasing in strength as the day progressed. 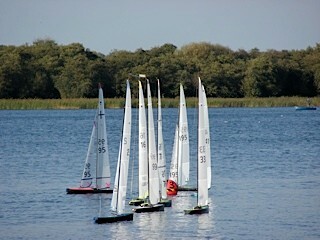 Race Officer Peter Sutton set a 800metre course with, due to the prevailing winds, a tight reaching start to a triangle with a beating leg and sausage in an area not used by the Norwich Club for five years, the Clubs area of the Broad has been plagued by a heavy blanket of “Nuttals Water Weed” since last June and despite having been completely frozen over and more lately the gale force winds is still not sailable. Peter Sutton explained the course to the skippers which due to the site change was set out with coloured tops to the buoys not anticipating that there could be skippers who were colour blind. Very good clean racing was seen with few mishaps and no recorded protests. 1st. Graham Bantock GBR95 (Chelmsford) Prime Number. 15 points. 2nd. Martin Crysell GBR52 (Guildford) Prime Number 46 points. 3rd. Rick Buxton. GBR41 (Broads) Rok. 50 points. 4Th. Roy Stevens. GBR54 (Two Islands) Prime Number. 52 points. 5th. Hugh McAdoo GBR16 (Guildford) Prime Number 56 points. The Whitlingham Trust. N.C.C. Outdoor Education Centre, Café-café at the Park.